o Definite trifascicular block (block involves all three fascicles). The following are examples of definite trifascicular block. o Possible trifascicular block: The following are examples of possible trifascicular block. o Nonspecific intraventricular block: This type of electrocardiogram (ECG) abnormality does not conform to any of the above intraventricular blocks. · Trifascicular block indicates that some form of conduction abnormality is present in all three fascicles. The conduction abnormality may be due to simple delay (first-degree block), intermittent block (second-degree block), or complete interruption (third-degree block) of the sinus impulse to all three fascicles. Trifascicular block does not imply that the block is always complete in all three fascicles. · Alternating bundle branch block: Whether it is a RBBB alternating with LBBB, or a RBBB recorded at one time and a LBBB recorded at some other time, such a block would constitute a trifascicular block because there is evidence that both bundle branches, and therefore all three fascicles of the conduction system, are involved. Example of RBBB and LBBB occurring in the same patient is shown in Figure 11.1. 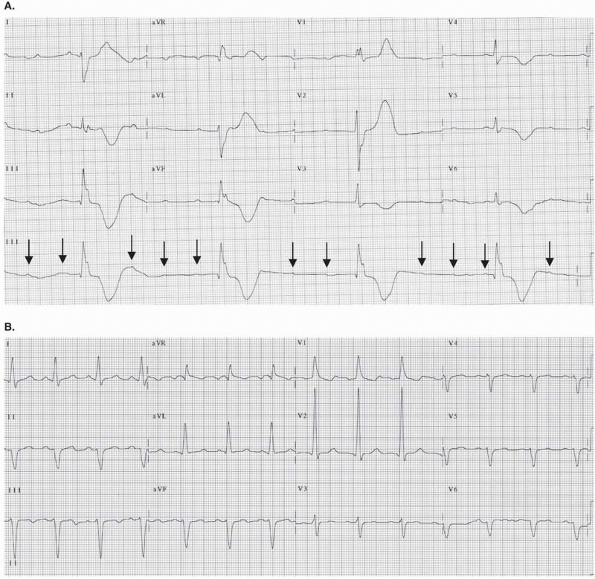 Another example of LBBB and RBBB occurring in the same patient is shown in Figure 11.2A, B. When LBBB and RBBB occur in the same patient, bilateral bundle branch block is present. This is an example of trifascicular block. · RBBB + alternating fascicular block: When RBBB is fixed and is accompanied by LAFB that alternates with LPFB, a trifascicular block is present because all three fascicles are involved (Fig. 11.3). This is a rare presentation of trifascicular block. · RBBB or LBBB + Mobitz type II second-degree AV block: Mobitz type II second-degree AV block is an infranodal block (see Chapter 8, Atrioventricular Block). When there is RBBB or LBBB with a type II second-degree AV block, the AV block is at the level of the His-Purkinje system. 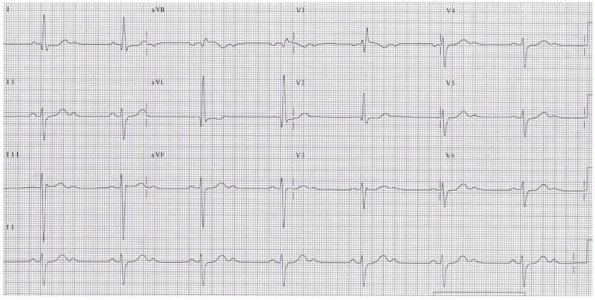 Thus, a RBBB or LBBB with a type II second-degree AV block suggests the presence of a trifascicular block (Fig. 11.4). both bundle branches. When this occurs, only a ventricular escape impulse can maintain the cardiac rhythm (Fig. 11.5A). Complete AV block with ventricular escape rhythm is most often a trifascicular block. However, should the complete block occur at the level of the AV node, it would not constitute a trifascicular block. Figure 11.1: Bilateral Bundle Branch Block. Electrocardiogram (ECG) A and ECG B are from the same patient taken 6 months apart. (A) Right bundle branch block (RBBB) with left anterior fascicular block. (B) Left bundle branch block (LBBB) with type II second-degree AV block. The presence of RBBB and LBBB in the same patient suggests bilateral bundle branch block. (B) also shows Mobitz type II second-degree AV block. Mobitz type II second-degree AV block in addition to LBBB is also indicative of trifascicular block. 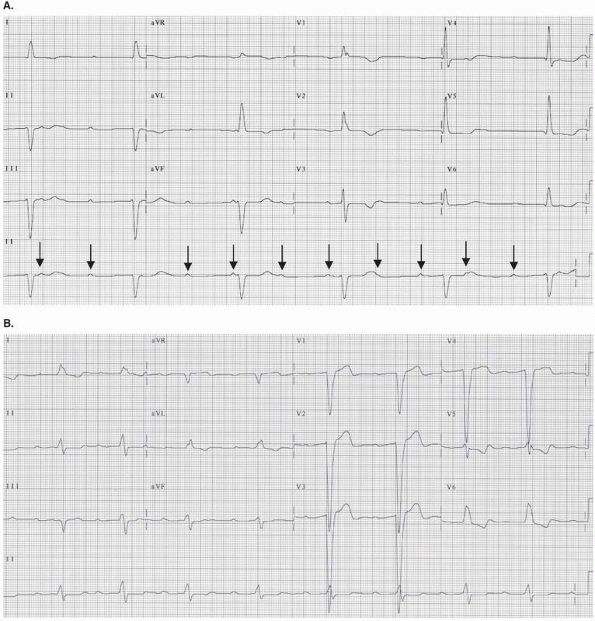 · Complete AV block with ventricular escape rhythm: Another example of complete AV block with ventricular escape rhythm is shown in Figure 11.6. The initial ECG showed LBBB with first-degree AV block. When a bifascicular or trifascicular block deteriorates into complete AV block with ventricular escape rhythm, the AV block is almost always trifascicular. Figure 11.2: Bilateral Bundle Branch Block. (A, B) From the same patient. The initial electrocardiogram (ECG) (A) shows left bundle branch block (LBBB) with deep S waves in V1. 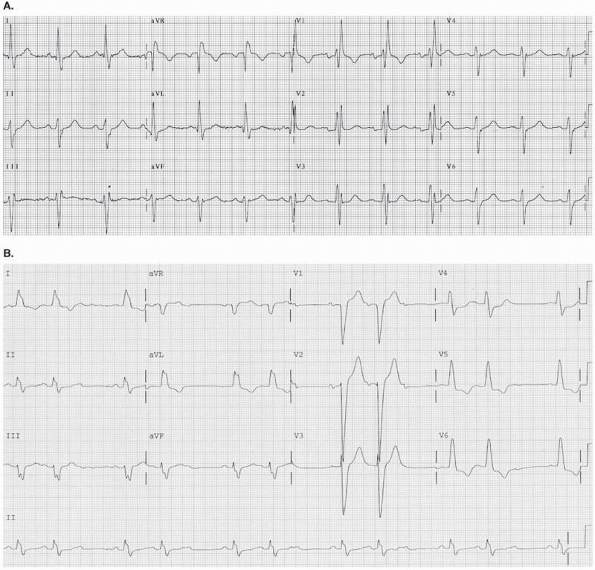 Subsequent ECG taken a year later (B) shows right bundle branch block (RBBB) + left anterior fascicular block. The presence of LBBB and RBBB in the same patient is consistent with bilateral bundle branch block. Note also that there is first-degree atrioventricular block in both ECGs, which in the presence of bifascicular block, is also indicative of trifascicular block. Figure 11.3: Fixed Right Bundle Branch Block (RBBB) + Left Anterior Fascicular Block Alternating with Left Posterior Fascicular Block. The precordial leads show RBBB. The frontal leads show left anterior fascicular block alternating with left posterior fascicular block. This conduction abnormality is an example of trifascicular block. · Any bifascicular block + first-degree or second-degree AV block: RBBB + LAFB + second-degree AV block (Fig. 11.7), RBBB + LPFB + second-degree AV block (Fig. 11.8), and LBBB + second-degree AV block are all possible examples of trifascicular block. Bifascicular block with second-degree AV block is not always the result of trifascicular block because the AV block can occur at the AV node instead of the remaining fascicle. · When there is a bifascicular block such as RBBB + LAFB, the only pathway by which the atrial impulse can reach the ventricles is through the remaining posterior fascicle. Note that the atrial impulse may be delayed or interrupted at the level of the AV node or at the distal conducting system resulting in first-degree or second-degree AV block. Should the first-degree or second-degree AV block involve the remaining fascicle, a trifascicular block would be present. Should the first-degree or second-degree AV block occur at the AV node, it would not qualify as a trifascicular block. This latter condition must therefore be excluded before diagnosing a trifascicular block. RBBB + LAFB + type I second-degree AV block is shown in Figure 11.9. This is usually an AV nodal block, but it is also possible that the block is trifascicular, involving the remaining fascicle. Figure 11.4: Mobitz Type II Second-Degree Atrioventricular (AV) Block. Mobitz type II second-degree AV block is a disease of the distal conduction system. The rhythm strip above was recorded in lead V1. It shows right bundle branch block (RBBB) and second-degree AV block with a fixed PR interval from Mobitz type II AV block. The presence of RBBB and Mobitz type II AV block is consistent with trifascicular block. Figure 11.5: Complete Atrioventricular (AV) Block with Ventricular Escape Rhythm. Electrocardiogram (ECG) A shows complete AV block with ventricular escape rhythm. ECG B was obtained from the same patient several hours earlier showing right bundle branch block + left anterior fascicular block. The presence of ventricular escape rhythm and a previous ECG showing bifascicular block suggests that the complete AV block is infranodal. Figure 11.6: Complete Atrioventricular (AV) Block with Ventricular Escape Rhythm. Electrocardiogram (ECG) (A) shows complete AV block with ventricular escape rhythm. The P waves are nonconducted (arrows). ECG (B) taken 2 months earlier shows left bundle branch block with first-degree AV block, which is consistent with trifascicular block. Figure 11.7: Right Bundle Branch Block (RBBB) + Left Anterior Fascicular Block (LAFB) + Second-Degree Atrioventricular (AV) Block. This 2:1 second-degree AV block combined with RBBB and LAFB is almost always a trifascicular block. Figure 11.8: Right Bundle Branch Block (RBBB) + Left Posterior Fascicular Block (LPFB) + Second-Degree Atrioventricular (AV) Block. A 2:1 second-degree AV block in association with RBBB and LPFB is almost always a trifascicular block. Figure 11.9: Right Bundle Branch Block (RBBB) + Left Anterior Fascicular Block (LAFB) + First-Degree and Second-Degree Atrioventricular (AV) Block = Trifascicular Block. The 12-lead electrocardiogram (ECG) shows RBBB + LAFB. There is also first-degree and type I second-degree AV block (arrow). 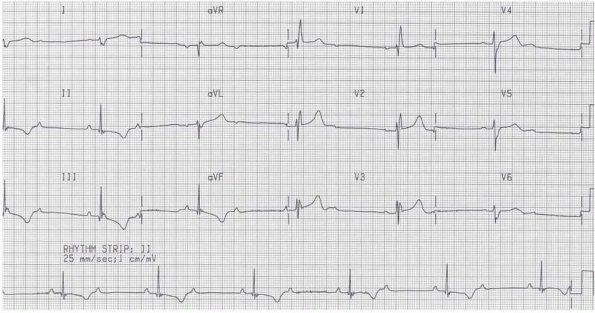 This combination of ECG abnormalities may be due to trifascicular block. · Complete AV block resulting from trifascicular block is invariably fatal unless a permanent pacemaker is implanted. The presence of trifascicular disease therefore should be recognized so that a permanent pacemaker can be implanted before the conduction abnormality progresses to complete AV block. Bifascicular or trifascicular block with subsequent development of intermittent or persistent complete AV block is a Class I indication for permanent pacemaker implantation regardless of the presence or absence of symptoms according to American College of Cardiology/American Heart Association/Heart Rhythm Society guidelines. o Alternating bundle branch block: Before complete AV block develops, trifascicular block may manifest as a more subtle abnormality, such as RBBB alternating with LBBB. When this occurs, a delay in the impulse (first-degree block) in one bundle branch alternates with delay in the other bundle branch, resulting in alternating bundle branch block. The presence of RBBB alternating with LBBB suggests disease of both bundle branches and is consistent with bilateral bundle branch block or trifascicular block. o RBBB + alternating fascicular block: RBBB is constantly present in the precordial leads with the axis in the frontal plane alternating between left axis deviation >-30° and right axis deviation >90°. This is due to a delay in one fascicle alternating with a delay in the other fascicle. This is consistent with trifascicular block. bundle branch block because type II second-degree AV block involves only the distal conduction system. o Bifascicular block + first-degree or second-degree AV block: First-degree AV block as well as type 1 second-degree AV block can occur anywhere within the conduction system including the AV node or more distally within the bundle branches or fascicles. When AV block occurs in the setting of bifascicular block, the AV block may involve the third or remaining fascicle, in which case a trifascicular block would be present. It is also possible that the AV block may not be in the third fascicle, but at the level of the AV node, in which case it would not be a trifascicular block. The block is trifascicular only if the first-degree or second-degree AV block involves the remaining fascicle. o Complete AV block with ventricular escape rhythm: Trifascicular block is present when there is simultaneous block involving both bundle branches or all three fascicles of the conduction system. The ECG will show complete AV block. The escape rhythm can originate only from the ventricles. If bifascicular or trifascicular block is present in previous ECGs, complete AV block with a ventricular escape rhythm is almost always the result of a block in the His-Purkinje system. · Patients with trifascicular block are at risk for developing complete AV block. The AV block can occur suddenly and can result in syncope (Stokes-Adams syndrome) or sudden death. The presence of trifascicular block should be recognized before complete AV block develops. · When complete AV block occurs, the level of the AV block should always be localized. AV block at the level of the AV node is often reversible and has a better prognosis than AV block occurring more distally at the level of the His-Purkinje system. 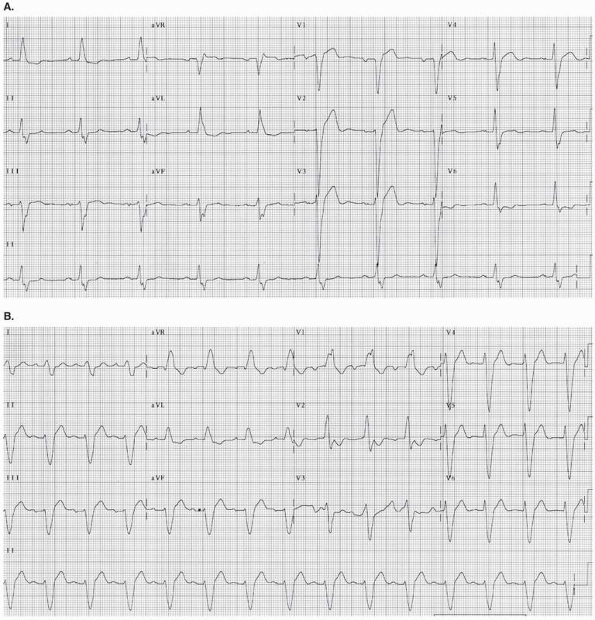 The patient's history, previous ECG, presence and location of the acute myocardial infarction (MI), and the origin of the escape rhythm are helpful in localizing the level of the AV block. o History: The block is most likely AV nodal if the patient gives a history of taking medications that can block the AV node such as beta blockers, calcium channel blockers (verapamil and diltiazem), and digitalis. o Previous ECG: The presence of distal conduction system disease such as bundle branch block, bifascicular block, or trifascicular block suggest that the AV block is in the distal conduction system. o Acute MI: When acute MI is associated with AV block, the AV block is at the level of the AV node if the MI is inferior. It is infranodal and at the level of the His-Purkinje system if the MI is anterior. o Escape rhythm: When the AV block is infranodal, the escape rhythm is always ventricular. When the AV block is at the level of the AV node, the escape rhythm is usually AV junctional. · The presence of bundle branch block (especially LBBB) may be a marker of severe myocardial disease and left ventricular systolic dysfunction. When a patient with bifascicular or trifascicular block presents with syncope, progression to complete AV block is likely. However, one should not overlook the possibility that ventricular tachycardia rather than complete AV block may be the cause of the syncope. Insertion of a permanent pacemaker to prevent bradyarrhythmia may not alter the prognosis of patients with severe myocardial disease if the cause of the syncope is a ventricular arrhythmia. · The causes of trifascicular block include idiopathic cardiomyopathy, ischemic heart disease, hypertension, valvular heart diseases (especially calcific aortic stenosis), fibrosis or calcification of the conduction system, infiltrative cardiac diseases such as sarcoidosis, hypothyroidism, myocarditis, and other inflammatory heart diseases such as Dengue fever, diphtheria, leishmania, and Lyme disease. The following are the indications for implantation of permanent pacemakers in patients with chronic bifascicular and trifascicular block according to the American College of Cardiology/American Heart Association/Heart Rhythm Society guidelines. Class IIa: The weight of evidence is in favor of usefulness or efficacy of a procedure or treatment. · Syncope not demonstrated to be due to AV block when other likely causes have been excluded, specifically ventricular tachycardia. · Incidental finding at electrophysiological study of markedly prolonged HV interval (≥100 milliseconds). · Incidental finding at electrophysiological study of pacing induced infra-His block that is not physiological. Class IIb: Usefulness or efficacy of the procedure or treatment is less well established. · Neuromuscular diseases with bifascicular block or any fascicular block with or without symptoms. These include myotonic muscular dystrophy, Erb dystrophy, and peroneal muscular atrophy. Class III: The procedure is not useful or effective and in some cases may be harmful. · Fascicular block without AV block or symptoms. · Fascicular block with first-degree AV block without symptoms. o Complete AV block involving the distal conducting system is often sudden and unexpected. Thus, the ECG manifestations of trifascicular block should be recognized before complete AV block becomes manifest. When there is evidence of trifascicular block, a permanent pacemaker should be inserted, even in asymptomatic patients, because there is no effective medical therapy for complete AV block at the level of the distal conduction system. o Therapy should target the underlying cause of the conduction abnormality, such as ischemic cardiomyopathy, hypothyroidism, sarcoidosis, myocarditis, or other inflammatory diseases. Whenever there is a need for permanent pacing in patients with bifascicular or trifascicular disease, left ventricular systolic function should be evaluated with an imaging procedure such as echocardiography. In this era of advanced technology, the need for permanent pacing for bradycardia should also take into consideration the need for biventricular pacing and automatic defibrillation in patients with severe left ventricular systolic dysfunction. · Prognosis depends on the cause of the trifascicular block. If the conduction abnormality is an isolated abnormality resulting from sclerosis or degenerative disease of the conduction system, prognosis after insertion of a permanent pacemaker is the same as for patients without the conduction abnormality. Most patients with trifascicular disease may have associated myocardial disease. The prognosis of these patients depends on the etiology of the conduction abnormality. Dunn MI, Lipman BS. Abnormalities of ventricular conduction: fascicular block, infarction block, and parietal block. In: Lippman-Massie Clinical Electrocardiography. 8th ed. Chicago: Yearbook Medical Publishers, Inc; 1989:148-159. Epstein AE, DiMarco JP, Ellenbogen KA, et al. ACC/AHA/HRS 2008 guidelines for device-based therapy of cardiac rhythm abnormalities: a Report of the American College of Cardiology/American Heart Association Task Force on Practice Guidelines (Writing Committee to Revise the ACC/AHA/NASPE 2002 Guideline Update for Implantation of Cardiac Pacemakers and Antiarrhythmia Devices). J Am Coll Cardiol. 2008;51:2085-2105. Willems JL, Robles de Medina EO, Bernard R, et al. Criteria for intraventricular conduction disturbances and pre-excitation. J Am Coll Cardiol. 1985:1261-1275.